Hyperplasia or “hypergenesis” refers to an increase in the number of cells within a given tissue as a result of cellular proliferation. Since hyperplasia refers to an increased number of cells, the cell appears normal in size, but can lead to an enlargement of an organ or tissue. Such proliferation occurs in response to a particular stimulus and remains under mechanisms of regulation by the cell. In some cases, hyperplasia can be a pathological response to abnormal levels of growth factors or hormones, resulting in a number of disorders. Moreover, since the cells are rapidly dividing, it increases the risk of cancer, due to unregulated cellular proliferation in the absence of physiological stimuli. There are numerous causes of hyperplasia, including the demand for increased tissue to compensate for a loss of cells (e.g., the skin or wound healing), chronic inflammation, hormones, growth factors, and diseased tissue within the body. Some forms of hyperplasia are required on an ongoing basis, such as the replacement of skin cells as they are sloughed off from the epidermal layer. In addition, hyperplasia is also required in the breasts of pregnant women for the growth of the milk glands in order to breastfeed the newborn. The process of hyperplasia is also used (and abused) in various sports for the purpose of increasing the number of skeletal muscle cells to improve athletic performance. 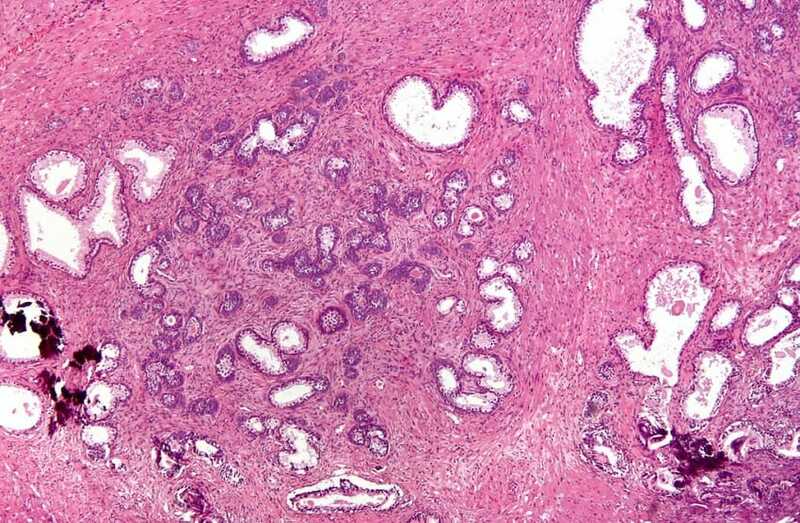 Benign prostatic hyperplasia is an enlargement of the prostate due to hyperplasia of the epithelial and stromal cells comprising the prostate (shown below). Such hyperplasia causes the formation of discrete nodules on the prostate which can eventually obstruct the bladder, causing complications such as bladder stones, kidney disease, and urinary tract infections. It is thought that testosterone and its metabolites play a key role in the induction of hyperplasia of the prostate. One reason for increased levels of testosterone in this tissue is hypothesized to be the result of the insufficient drainage of the spermatic venous system, which increases the hydrostatic pressure and testosterone in the prostate, thereby inducing hyperplasia. Cushing’s disease results from hyperplasia of the adrenal cortex in response to the enhanced secretion of adrenocorticotropic hormone from the anterior pituitary. Such enhanced secretion is often caused by the overproduction of hypothalamus corticotrophin releasing hormone or a pituitary adenoma. Sebaceous hyperplasia involves hyperplasia of the sebaceous glands located in the skin. This condition is commonly observed in newborn infants and older adults and is characterized by the increased secretion of sebum (the oily substance secreted by the sebaceous glands) and formation of yellow-colored papules on the face. This condition is typically self-resolving, but laser treatments are also available. Intimal hyperplasia refers to hyperplasia of the tunica intima (endothelial lining) of blood vessels in response to injury. Since this process is a normal physiological response, it often causes graft failure following any form of vascular reconstructive or bypass surgery. Compensatory liver hyperplasia involves hyperplasia of the liver hepatocytes in response to damage or injury. This gives the liver its unique regenerative ability and allows for substantial liver resections (e.g., for the purpose of liver transplantation). Endometrial hyperplasia refers to hyperplasia of the uterine inner lining in response to elevated levels of estrogen. Estrogen can be overproduced in conditions, such as obesity, various cancers, polycystic ovary syndrome, and other exogenous sources of estrogen (e.g., hormone therapy). This condition is associated with an increased risk of cancer. A. The enlargement of skeletal muscle cells. B. The proliferation of skeletal muscle cells. C. The proliferation of ductal cells in the breasts during pregnancy. D. The enlargement of ductal cells in the breasts during pregnancy. B and C are correct. The “hyperplasia” refers to the proliferation of the cells in a particular tissue or organ, whereas “hypertrophy” refers to the enlargement of cells in a particular tissue or organ. The terms are often confused. A. Regulated cellular proliferation in response to environmental stimuli. C. Tissue repair in response to injury. D. Cellular proliferation in the absence of environmental stimuli. A, B, and C are correct. Hyperplasia is a normal physiological response of cells to various environmental stimuli (e.g., injury, hormones, growth factors, etc.). Thus, unregulated cellular proliferation is a characteristic of cancerous cells, termed neoplasia. Eleazu C, Eleazu K, and Kalu W. (2017). Management of Benign Prostatic Hyperplasia: Could Dietary Polyphenols Be an Alternative to Existing Therapies? Front Pharmacol. 8:234. Kholodenko IV and Yarygin KN. (2017). Cellular Mechanisms of Liver Regeneration and Cell-Based Therapies of Liver Diseases. Biomed Res Int.2017:8910821. Loriaux DL. (2017). Diagnosis and Differential Diagnosis of Cushing’s Syndrome. N Engl J Med. 376(15):1451-1459. Nussey S and Whitehead S. (2001). Endocrinology: An Integrated Approach. BIOS Scientific Publishers; Oxford, UK.